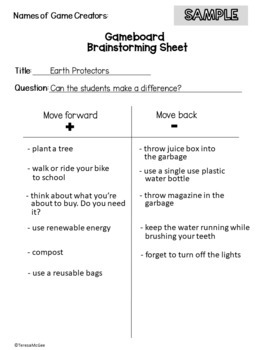 A fun and engaging activity for Earth Day! 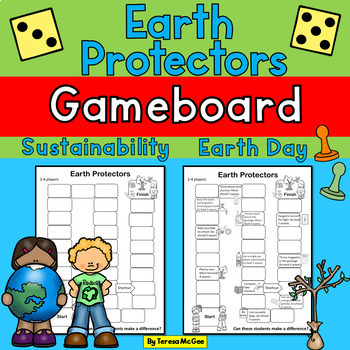 The students work with a partner to create their own Earth Protector gameboard. They love making and playing these. It really gets them talking about what we can do to protect our environment. Helpful choices or actions allow the players to move ahead, and not so helpful actions move the players back. The students come up with five of each (class brainstorming as needed). 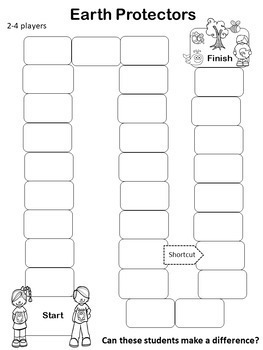 This resource includes samples, a brainstorming sheet, and a gameboard. I have used clip art to illustrate my spaces, but the students can draw their own simple pictures. 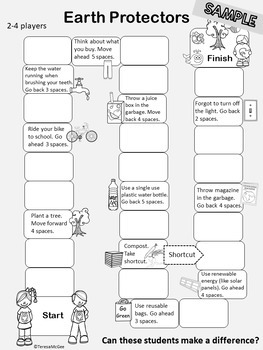 I suggest enlarging the gameboard so that the students have more space to write and draw in. Making gameboards is a fun activity, but it also involves a lot of learning. E.g. planning, speaking and listening, writing, drawing, printing and cooperative learning. Also on the theme of the environment, please check out my free reader's theater script, The Veggie Thief, which features community gardening (grow local). If you enjoyed using these resources your feedback/ratings are greatly appreciated! If you're interested in my kid-friendly (and teacher friendly) scripts, plays, and writing activities, please check out my teaching resources here. Enjoy your Earth Day activities!